Taxes within EasyCart are highly configurable and made to work in many international situations necessary for online eCommerce. Setting up taxes based on a country or state/province is easy, but we also provide special taxing situations for US such as TaxCloud automated taxes, Canadian taxes, as well as VAT. 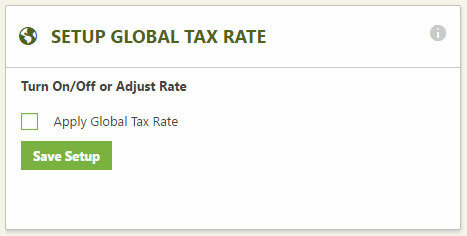 You can add a simple global tax rate on every country, state and order coming through EasyCart by setting this section with a single rate. This section allows taxes to be calculated after the user enters their billing/shipping addresses based on their country. For validation purposes, it’s important to have your country and states within the billing/shipping screen be pulldowns so that valid country codes are selected. The country/state pulldown settings are found within the checkout options section. 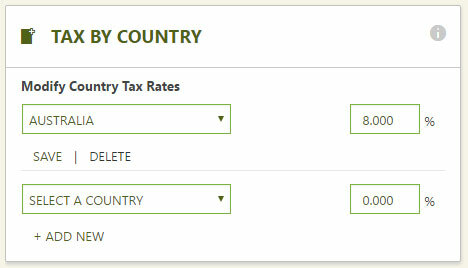 To use, simply select a country and enter a tax percentage. This section allows taxes to be calculated after the user enters their billing/shipping addresses based on their state/province. For validation purposes, it’s important to have your country and states within the billing/shipping screen be pulldowns so that valid state codes are selected. The country/state pulldown settings are found within the checkout options section. 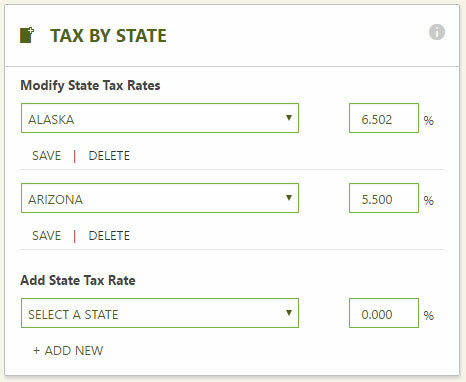 To use, simply select a state and enter a tax percentage. 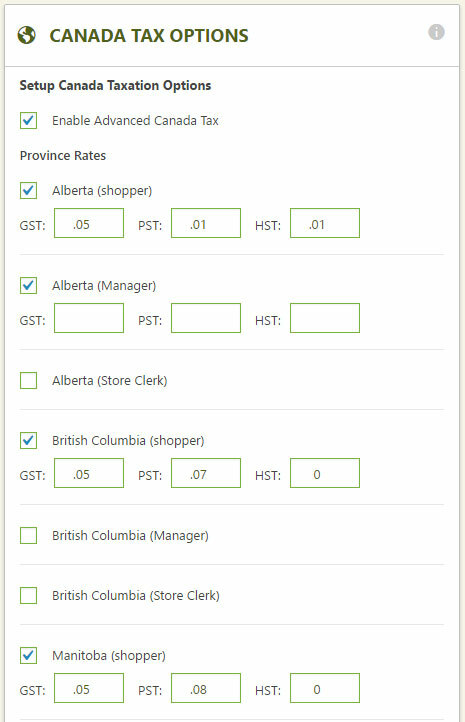 To have more flexibility with Canadian customers, EasyCart offers enhanced tax setup with each province able to have GST, PST or HST setups. You can also have different tax rates based on a user role you create within the accounts area. To use simply enable Canada Tax option, and then which province rates and set rates. 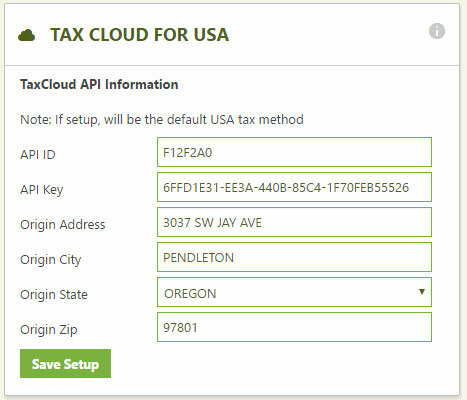 Tax Cloud is an automated service we have integrated with in EasyCart to allow precise taxes to be generated using their API. Enter all of your TaxCloud information to connect the system and it will return tax rates based on a products tax code and location. This is a good option when states require taxes based on county or even city level. To use, simply go to taxcloud.com and get an account. Enter your details below. At the product level, you may also enter a tax code for each product, which is sent to taxcloud as well for accurate tax generation. Value Added Tax is a complex system that we integrated with EasyCart for many European and Australian customers. VAT Type: Setup VAT either globally, by entering a single VAT rate, or by country, to collect different VAT rates for different countries. VAT Pricing Method: You can choose to have VAT added at the product price level, or you can choose to have it added at the shopping cart. 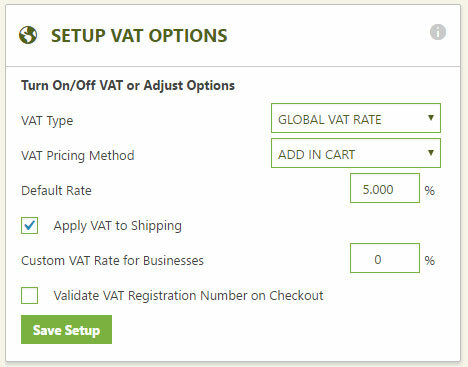 Default Rate: When a user views their shopping cart, you can set the default VAT rate. If you setup by country, it will calculate after they enter their billing/shipping address information. Global VAT rate users will see this default rate if that method is chosen. Apply VAT to shipping: You can choose to have shipping included in VAT or simply the shopping cart total. Custom VAT rate for Businesses: If you need to collect a different rate, or no VAT for businesses, you have that option here. Validate VAT Registration Number on Checkout: If you are using custom VAT rates for a business, it is nice to turn this feature on and validate registration numbers as well.